A trove of paintings by a previously unheralded, self-taught artist from Spartanburg, South Carolina, provides the core material of a new traveling exhibition that offers a personal vision of the strength and creativity of African-American life during the final decades of segregation. Rising Above Jim Crow: The Paintings of Johnnie Lee Gray opens in New York City on November 20 at the Schomburg Center for Research in Black Culture (a division of the New York Public Library). The exhibition encompasses some 35 paintings by Gray (1941-2000) as well as a selection of archival photographs and video interviews that place the artwork in its historical and social contexts. Raised in a sharecropper family, Johnnie Lee Gray attended the segregated black high school in Spartanburg County, South Carolina, then served in the army for seven years, including a tour of duty in Vietnam. Although he worked in textile mills after returning home and later became a carpenter, he always viewed himself as an artist, having drawn since childhood. In 1978, he met and married Shirley Sims and began to paint for the first time, From that point until his death in 2000 at the age of 58, he completed approximately 150 paintings. Most of Gray’s paintings evoke his experiences as an African-America living in the Jim Crow South and into the first decades of desegregation. 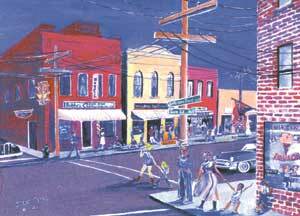 He painted scenes of fieldwork (recalled from childhood, when he served as a water by during harvests), church life, night life, civil rights demonstrations and the changing city. Among the themes of the exhibition are the strength of family; the sense of community in both rural and urban settings; the power of the African-American church; and the process of migration, both physical and spiritual, as African-Americans searched for a better life.